Limit 3 per person, may buy 2 additional as gifts. $7.99 shipping paid upon redemption. Does not ship to AK/HI/Canada/Puerto Rico. Most orders arrive within 10-12 business days from time of redemption. Our quality canvas prints are guaranteed against fading for 100 years or we will happily reprint them at no charge. From side tables and shelves, to mantles and walls, our photo easel canvas is perfect for decorating any area of your home with your favorite photographic remembrances. Furthermore, our easel back canvases are not only perfect for dressing up any room; they bring your memories to life. For more options, check out our other canvas sizes and fill up any blank and drab areas in your home with color. In addition to our easel back canvases, our small canvas prints and large photo canvases will make a great addition to any decor. Includes a wall hanger and easel making it perfect for walls or desks. With today’s smart phones, it couldn’t be easier to capture life’s most cherished moments. From weddings and birthday parties to vacations and holidays, we all have photos that are truly worthy of display for all to admire. Why not create your own gallery wrapped canvas to showcase your favorite photos virtually anywhere. Dress up a drab bookcase with color and add a canvas with your favorite vacation photo. Spice up your bedside table top with an elegant wedding photo or even jazz up your wall decor with your kids’ first school day picture. Small canvas prints are perfect for photos of all occasions and are great for adding interest to any home decorating style. If you like mini canvas prints, check out our Canvas Lites which also include an easel backing for easy display. They will make the perfect addition to any room in your home and are guaranteed to brighten your day. To get your easel back canvas started, simply upload a cherished photo and choose your preferred size. You can even select between a horizontal or vertical orientation for the perfect fit. Then, just drag and drop your photo onto your canvas in the project builder and place your order. Afterwards, set your easel back canvas prints on any shelf or table top around your home. Our easel back canvas is guaranteed to be a new favorite decorative accessory that your friends and family will love. No matter the decor, you can be sure that our easel canvas will add a quality touch to the style of your home. Each canvas has gallery wrapped edges that will add a sophisticated flair to any setting, both formal and casual. Whether your style is traditional or modern, your memories will look stunning on any table top, wall or shelf. Make your memories stand out anywhere in your home from your bedroom and entrance hall to your living room or family area. Add a little personality to your kitchen counter top or brighten up an upstairs hallway with a favorite photo that you love whether you are designing mini canvas prints or easel back canvases. 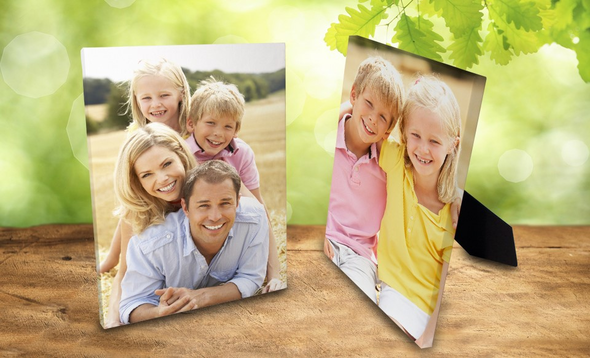 For versatility, you can’t beat our custom easel back photo canvas. Simply choose your photo and display it anywhere around the house for an updated, sophisticated look. Stand it on any table top or hang it on any wall for an added boost of character. Whether you want to add interest to your decor, show off a favorite photo or even create an unusual gift, our easel back canvas is perfect, no matter the occasion. With our easel back small canvas prints you can relive your favorite memories, every day! Are some of your photos on canvas worth sharing? In addition to canvas, you can order 5×7 prints to add to your favorite album and give out to family and friends. For photo printing, sharing, and home decor, MailPix has all the options you need on one convenient site!